I'm always hesitant when it comes to reading other people's journals. Journals are private things. However, one of the best books I ever read was "The Diary of Anne Frank" so I figured I'd dive right into Kerouac's notes. Never having read anything by Mr. Kerouac before, I had no idea what I was in for. His reputation preceeds him, and my curiosity peeked, I discovered a whole new world. Editor Douglas Brinkley says, "As editor, I've taken the liberty of making internal edits. But I've maintained the intensity of Kerouac's original text to the best of my ability. And while technically Windblown World deals with Kerouac's writing of two novels, it also sets the stage for such other works as Visions of Cody, Doctor Sax, and Book of Dreams". His religious outlook seemed suffocating and his copious notes of prayers, pleas to God for guidance, psalms and poems, is enlightening. Writing is not an easy profession and often, one suffers for one's art. Kerouac's diary notes reflect his thoughts while writing, his despair, his determination, and bits and pieces of his life at the time. At times I felt Kerouac was searching for the meaning of life (as many of us are) and it becomes torturous and agonisingly confusing - we all want clues as to some direction in our lives. 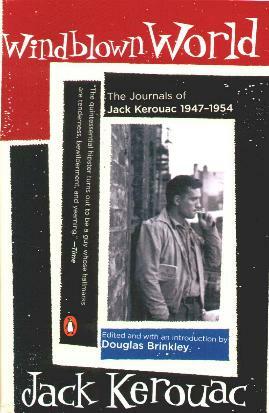 Some of Kerouac's actual pages of notes have been reproduced in this book and you can read his very words! There's an interesting "cast of characters" as well, noting friends of his, how they were connected, and their "parts" in his two books. These daily notes of what he did, how much he wrote, his friends, and his feelings can become laborious at times. I know I have to find the time to read his two novels, On the Road and The Town and the City. I don't know why it's taken me so long. Conclusion - Interesting to see he's not the only plagued writer. Can become tiring.